Rehydrate the gelatine in water. Pour 100ml of buttermilk and sugar into a pan, warm carefully. Squeeze the gelatine so all the water is gone, place into the warm buttermilk. Dissolve the gelatine, then add the rest of the buttermilk and xanthan. Pass buttermilk mixture through a fine sieve and let it set overnight. Once the mixture has set, place into a mixing bowl and whip until the mixture has at least doubled in size. Place into a container with high sides and let it set, until needed. Halve each passionfruit and scoop the pulp into a saucepan. Add the sugar and simmer gently for 5 minutes. Pour the passionfruit sauce into a food processor. Using the plastic blade, process for 1 minute. Pass the sauce through a sieve. If any scum appears on the surface stir through a knob of butter. Combine the passionfruit nectar, sugar, gellan or agar-agar in a pot and bring to a boil. Pour the liquid on a flat tray, approx. 25 cm x 18 cm (10 in by 7 in), and quickly spread it all over the tray. Tilt the tray to get rid of any excess of liquid to obtain a very thin even film of about 1 mm. Do it fast or the liquid will gel before you get rid of the excess. This may require some practice but worst case scenario you may obtain a thicker film which is not so terrible. Allow to gel completely in the flat tray for a few minutes, then cut into squares big enough to cover a poached egg. Place the water and vinegar in a saucepan, bring to the boil, and then make a vortex with the water, a whirpool effect. Crack the room temp eggs into the vortex, cook until soft but shaped well, then use a slotted spoon and take them out the water. Place them onto a cloth keep them warm. 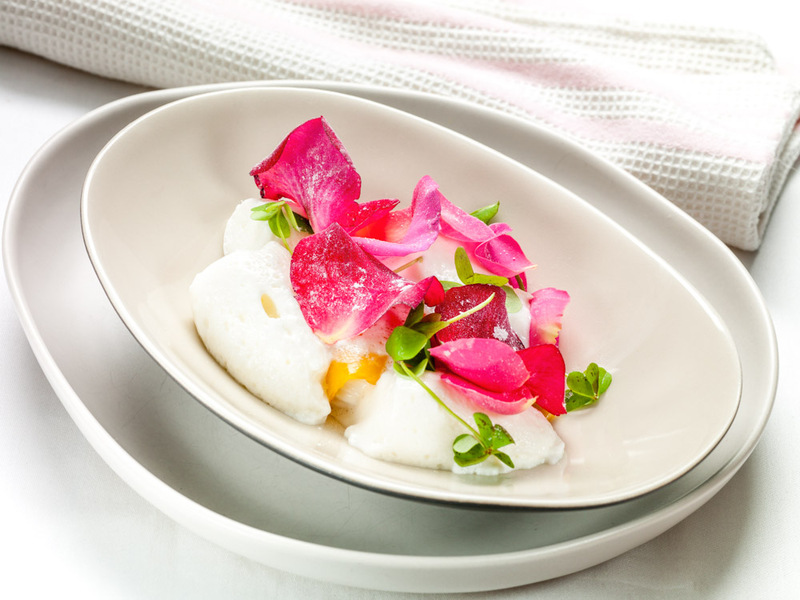 In bowls, place the passionfruit sauce on the bottom, then the egg, note eggs must be under 90 degrees. Sprinkle a little passionfruit sugar on top, then place passion fruit skin on top of the egg. Take a warm spoon and dip into the buttermilk mix. Turn the spoon to make quenelle shapes. Place quenelles around the eggs, sprinkle with more sugar and garnish with the roses, wild sorrel and more sauce if needed. Tip: It’s important to keep the egg soft as the yolk helps the sauce to coat your tongue. Watch Raymond make this recipe below, or on the Farm Pride YouTube channel.